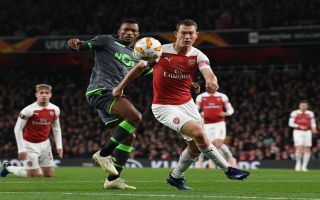 Arsenal right-back Stephan Lichsteiner added some excitement during Arsenal’s goalless draw against Sporting last night with a lovely gesture to one Arsenal youngster. In the 69th minute of the match Lichsteiner tied the shoelaces of Gunners hot prospect Emile Smith-Rowe, it seemed as though the 18-year-0ld missed the lesson on tying your shoelaces when he was honing his skills as a young kid. The whole ordeal was bizarre to say the least but Arsenal fans love how nice Lichsteiner seems to be to his teammates. Lichsteiner has certainly lifted the dressing room since his move to Arsenal from Juventus this summer, Lichsteiner looks to have the makings of a very good coach once he finishes his playing career. Unfortunately last night’s goalless draw was overshadowed by the serious injury which saw Danny Welbeck stretchered off and needing oxygen. Veteran Lichsteiner was also forced off with an injury.